BMW and Volvo servicing and spare parts (London & Surrey, UK) Serving Croydon, Merton, Kingston, Lambeth, Wandsworth, Richmond and Beyond. RAW spares is a small professional Garage and store specialising in BMW and Volvo spares, servicing and salvage. We have been in business for 12 years over which time we have grown to our present size. Our staff are knowledgable, friendly and very professional. We pride ourselve on providing a prompt service at a fair price. We despatch BMW and Volvo Spare parts nation wide. 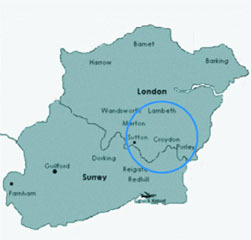 However our BMW and Volvo Maintenance deliveries are restricted to the circle shown. You are of course free to bring and collect your car if you are located outside this area. Although we are based is in Croydon South London / Surrey, we are able to service a wider area. Norbury, Streatham, Clapham, Balham, Tooting, Sutton, Purley, Richmond, Kingston, Norwood. We offer a mail order service to anywhere in the UK.